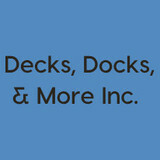 Decks, Docks, & More Inc.
Our services include, but are not limited to, boat docks, boat lifts, decks, and outdoor spaces. We have over 10 years of experience working in the area. 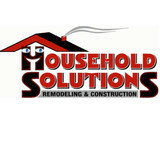 We are a fully insured and licensed business. Attention to detail and outstanding customer service is what we strive for here at Decks, Docks, & More Inc.
What we do: Consultation: Our experienced consultants will review and, if necessary, revise the plan for your new home or remodel, we work with you to find the perfect plan for your lifestyle from our extensive library of plans. We can also design the perfect plan from scratch. Site evaluation & planning: We will ensure that your lot is buildable and provide a site plan for the placement of your home on the lot. No cost/ No obligation Quotes: we will completely price out every detail of your remodel or new construction project without obligation or cost BEFORE you sign anything. The "Solution" you can count on! Please contact us anytime! We look forward to hearing from you. 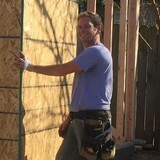 Your Pro Builder, Jim Anderson, has been in the construction business for over 30 years, building everything from golf courses to custom homes and everything in between. Renew Crew of Little Rock is the Little Rock area’s best source for deck cleaning and protecting as well as concrete, patio and fence cleaning. We even do siding! We clean and protect your outdoor surfaces so you can focus on loving your outdoor lifestyle. What services do deck and patio builders in Conway, AR provide? To help you choose the ideal style, configuration and materials for your deck or patio, your deck and patio contractor will survey your Conway, AR lot and your home to come up with a design that complements your exterior as well as being structurally sound. He or she will recommend sizes, heights and construction materials that suit your lifestyle and climate, as well as explain the best stain or finish options. Additionally, deck and patio professionals can provide insight into additional components such as outdoor kitchens, patio covers, fire pits, outdoor lighting, arbors and more. Your deck and patio professional might work closely with another Conway, AR lawn and landscape professional. Here are some related professionals and vendors to complement the work of decks, patios & outdoor enclosures: Landscape Architects & Landscape Designers, Garden & Landscape Supplies, Stone, Pavers & Concrete, Landscape Contractors, Building Supplies. 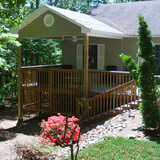 Find a deck and patio builder in Conway, AR on Houzz.